A Little Diamond: r u my stalker? The other day at work, something unusual happened. I received a box. This in and of itself is not unusual. Vendors often send me tchotchkes and goodies. 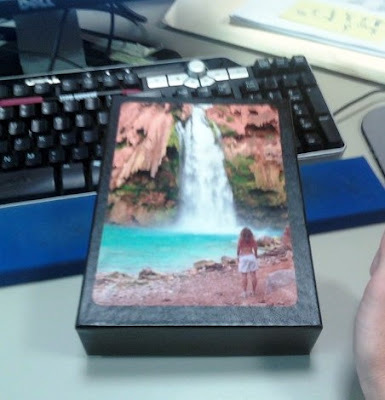 But this box was from Shutterfly. Or maybe it was Snapfish. I should really blog faster so that the details don’t get so fuzzy by the time I get around to posting. Either way, photo websites are not my usual vendors and they do not send me unsolicited presents. Interesting…. This is the picture that the puzzle will make once put together. Look familiar? It should, because it is this picture here. Apparently someone uploaded the picture from the internet and used it to make me a present. But where did this present come from?!?! I have no idea! Maybe it was a gift from a friend who didn’t realize that there would be no sender-identification with the box. Maybe that friend thinks I am being rude for not thanking him/her for such a cool gift. NFBF -was it you? Or maybe it was my sister whose recent i-phone acquisition has enabled her to join the ranks of my super-cool followers. Elaine? Nicole? Some people have suggested that it was Pat. I’m pretty sure it wasn’t him because he doesn’t even read my blog and thus has probably never even seen the picture that is on this puzzle. I have a mystery on my hands! Who is my stalker? Is it you? 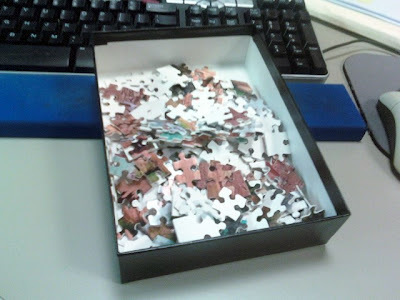 If it is you, please know that I think the puzzle is a really cool gift. Please also know that you are a little bit creepy. Maybe in the future you could sign your name to your really cool gifts. K? Thx. not me, dude. i don't even know where you office is. I'll take Nicole's answer and also add, I only wish I was that cool. I want to be the kind of friend that thinks of that kind of gift. I said "kind" twice. I should also be the kind of friend who edits before she hits PUBLISH! Facebook has turned me sloppy, lazy! I can't believe you don't know who it's from. After all those years of watching you from afar. Kinda creepy. Maybe it's the same person who broke into my house and stole my digital picture frame and camera lens - that person seems to like things dealing with pictures. That is a cool gift! Have you found your stalker yet? I'm totally stealing the idea.